Hivos, Greenpeace Netherlands and the Coordinator of Indigenous Organizations of the Amazon River Basin (COICA) have launched a new campaign called “All Eyes on the Amazon” against deforestation in the Amazon rainforest. This unique coalition between environmental and human rights organisations received a 14.8-million-euro contribution from the Dutch National Postcode Lottery’s Dream Fund. 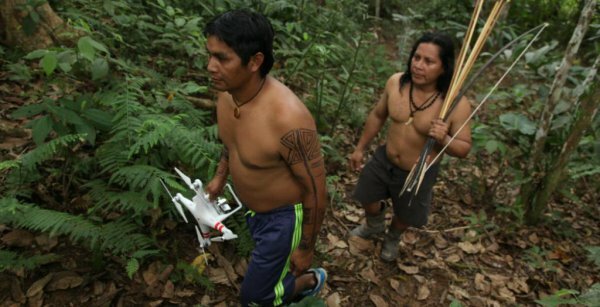 It will use satellite technology and drone photography in order to give indigenous groups evidence of the deforestation and to encourage them to take action, whilst protecting activists that face dangerous reprisals. Greenpeace also underlined how this project will expose international supply chains exploiting the Amazon’s last resources, stating that the Brazilian government’s inaction towards the matter will only make them more determined. An increasing amount of scientific studies show how indigenous communities are essential in safeguarding the precious resources found in the Amazon rainforest, underlining the importance of projects like this where the livelihoods of indigenous people and the environment are severely at stake. Hivos and Greenpeace Netherlands, together with indigenous groups from the Amazon rainforest, are launching a new campaign against deforestation. The programme, All Eyes on the Amazon, has been made possible thanks to a 14.8-million-euro contribution from the Dutch National Postcode Lottery’s Dream Fund. It will combine modern technologies, such as satellites, drones and tablets, with the centuries old knowledge of the Indigenous inhabitants of the Amazon. The contribution was announced at the Postcode Lottery’s 2017 Goed Geld Gala (“Good Money Gala”) charity awards held in Amsterdam on 6 February. To halt deforestation in the Amazon, an exceptional coalition has been created between environmental and human rights organisations and the prominent Coordinator of Indigenous Organizations of the Amazon River Basin (COICA). Quick action is needed because in the Amazon, both people and the environment are under more pressure than ever before. The hunt for the last natural resources, such as wood, oil, minerals and precious metals, is an enormous threat to our planet. More and more scientific studies show that indigenous communities living in rainforests are crucial to the sustainable protection of these areas. However, they often lack the tools, knowledge and contacts to defend their rights and the environment effectively. The All Eyes on the Amazon programme is going to change that, thanks to the support of the Dutch National Postcode Lottery. All Eyes on the Amazon will be run and implemented by a coalition of eleven environmental and human rights groups and local community groups. In addition to Hivos and Greenpeace, this includes the Coordinator of Indigenous Organizations of the Amazon River Basin (COICA), the International Institute of Social Studies (ISS), Digital Democracy (Dd), the World Resources Institute (WRI), the University of Maryland (UMD), INTERPOL LEAF, and the NGOS Both ENDS, WITNESS and ARTICLE 19. The Dutch National Postcode Lottery funds the programme. At its Goed Geld Gala awards ceremony, the Dutch Postcode Lottery announces which charities will receive both annual and one-off donations. This year, it is distributing a record total of over 341 million euros to 110 organisations and charities working for the good of people and nature in the Netherlands and abroad. Besides the €14.8 million euro Dream Fund award, Hivos also received an annual contribution of 1.35 million euros.